Demi Lovato has finally popped up on social media again in the wake of her near-fatal overdose earlier this year, and she made a splash with her message ... I'M VOTING!!! The "Sober" singer posted a photo on Instagram Tuesday showing herself at a voting booth, looking fabulous and grinning at the camera. She added a caption that read ... "I am so grateful to be home in time to vote! One vote can make a difference, so make sure your voice is heard!" 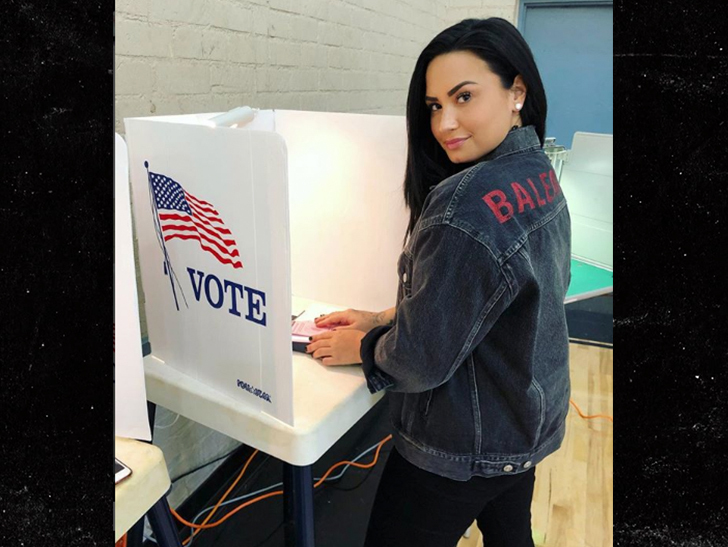 Demi also encouraged her fans to get out and vote themselves. This is the first time Demi has posted anything on social media since she overdosed in July, but it's definitely not the first time she's been seen out in public. We broke the story ... she's currently out of rehab after completing a 90-day program, and has been hanging with clothing line guru Henry Levy quite a bit since then. They were enjoying each other's company a lot this past weekend on back-to-back outings. We're told Henry's been in and out of rehab since he was a teen, and actually met Demi while they were both in rehab. He recently brought her to an AA meeting as well. Demi was hospitalized for 10 days following her overdose, and then checked into rehab at the beginning of August. Seems like she's doing great now, though.